Moist and delicious with a hint of cinnamon. Perfect for phase 3 breakfast with some cashew butter! In large bowl, combine eggs, oil, xylitol, water, zucchini, lemon juice. In a medium sized bowl, mix remaining dry ingredients. Add dry to wet and stir just until moist and combined. Do not over mix. Pour into silicone baking loaf pan, or other loaf pan that has been brushed with oil. Bake 35-45 minutes, until toothpick comes out clean. Test at 30 minutes. Baking time depends on the size of your pan. For P1 modification, use 2 egg whites instead of whole egg, and replace oil with oat milk in the same amount. I also throw in a bit more zucchini. Where do you find sprouted wheat flour? 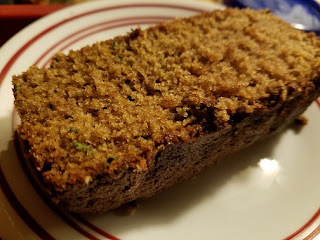 I just made this zucchini bread and it turned out awesome. Delicious. Thank you for sharing your recipes with the FMD group. Could you sub rice flour or almond flour? I love your zucchini bread! I have used less xylitol because I ran out and it did t hurt a thing! Yum! Carolyn, can you adjust this recipe to make it P1 compliant? Thank you! I just made it and it's cooling!! Can't wait to try it!! How many slices for haylie pomroy's <20 pounds? For half breakfast and dinner correct??? For p1, it's 6 servings per recipe, and for p3, it's 12 servings per recipe. Hi Carolyn, Let me being by saying thank you! I really enjoy your posts, recipes and advice! I am in my second round of FMD and recently joined the Facebook group. That is how I found you. Your blog is fantastic because your recipes are real! As a fellow foodie and cook I am loving your creativity and knowledge of FMD. I am baking this bread right now. I did have a couple of questions... have you ever used spelt flour for this in the phase 1 version? I had some, and was out of sprouted wheat flour tonight so I tried it :). Also, any suggestions for purchasing xylitol in bulk? Or sprouted wheat flour in bulk? I am finding xylitol to be cost prohibitive at $8.99 a pound-especially because I've been adding smoothies in to my diet and now trying a bit of bread baking. I live in Chicago but head your way often as my two oldest live in Chattanooga ...I'm definitely gonna find the grocery store Sprouts next time I'm in middle Tennessee. Thanks for your time in answering all my questions! I love spelt flour and prefer it over sprouted wheat, but it's only p1. I buy my xylitol online at Swanson Vitamins, they have 3lb cans for around 22.00, and I stock up when it's lb sale. I get sprouted wheat flour from Vitacost. I have a Swanson link to save you 10.00 if you need. can i use almond or rice milk in place of the oat milk?